"Fluent, well-timed, provocative. . . . Filled with gritty, shrewd, specific advice on foreign policy ends and means. . . . Gelb's plea for greater strategic thinking is absolutely right and necessary." 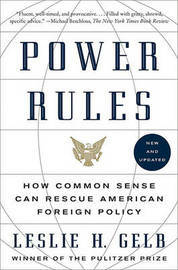 -- The New York Times Book Review "Few Americans know the inner world of American foreign policy--its feuds, follies, and fashions--as well as Leslie H. Gelb. . . . Power Rules builds on that lifetime of experience with power and is a witty and acerbic primer." -- The New York Times Power Rules is the provocative account of how to think about and use America's power in the world, from Pulitzer Prize winner Leslie H. Gelb, one of the nation's leading foreign policy minds and practitioners. Leslie H. Gelb is President Emeritus of the Council on Foreign Relations and a former columnist at The New York Times, where he was awarded a Pulitzer Prize for Explanatory Journalism. Gelb has worked as a senior official in the State and Defense departments. He lives in New York City.